In the dead of winter, minus 40 degree winds whistled through gaps around doors and windows of the decrepit portables that made up the entirety of their school. Until this month, that was life in elementary school in Attawapiskat. After a 14-year wait, children in the remote northern Ontario First Nations community have a real school again. In the dead of winter, minus 40 degree winds whistled through gaps around doors and windows of the decrepit portables that made up the entirety of their school. Bathroom water pipes routinely froze and burst and the oil furnaces that struggled valiantly to keep classrooms above zero broke down several times a month. 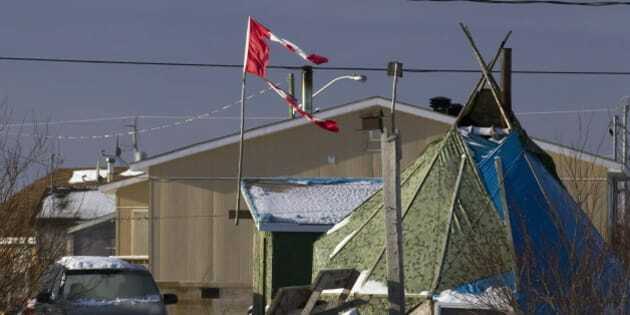 Until this month, that was life in elementary school in Attawapiskat. After a 14-year wait, children in the remote northern Ontario First Nations community have a real school again. According to a 2011 survey by the Assembly of First Nations, almost half of First Nations reserves need new schools -- and half of those have, like Attawapiskat, been waiting more than 10 years. Edwards, now 18, is a youth leader and education activist who plans to go to university to become a lawyer. She told us about her fight to get a new school for her community and how, as politicians and aboriginal leaders debate, and policies and budget priorities shift from one decade to the next, the losers are aboriginal children. In 1979, a pipeline rupture spilled 95,000 litres of diesel fuel contaminating the soil underneath J.R. Nakogee -- Attawapiskat's only elementary school -- causing illness among teachers and students. After 20 years of successive environmental investigations and promises of a cleanup, the federal government finally closed J.R. Nakogee in 2000. Edwards went to kindergarten that year in a school made of portables. It should have been a temporary move while the old school was demolished, the site cleaned and a new school built. But the next 12 years became a Kafkaesque odyssey of promises, proposals, funding agreements, funding cancellations and disputes between governments and band leadership. The old school wasn't even torn down until 2009. "We were told over and again we'd get a new school. Each time we'd believe them, then the school would fall through," Edwards said. Meanwhile, the portables -- not designed for a decade of constant use in northern Ontario's harsh climate -- quickly deteriorated. Sick of flirting with hypothermia as they studied, in 2008 Edwards joined her cousin Shannen Koostachin and other students in meeting with federal and provincial politicians and aboriginal leaders. They spoke to anyone who would listen in a desperate bid to simply find someone who could get them a new school. "It was confusing. We didn't know who took care of what, we didn't care about politics. We just wanted to go to school," Edwards told us. When 15-year-old Shannen was killed in a car accident in 2010, Edwards helped launch a youth-led national aboriginal education initiative in her cousin's name -- Shannen's Dream. After a generation of politics, Attawapiskat finally has its school. Edwards won't reap the reward -- her grade school days are long past. For her, victory is embodied in Brooke, her four-year-old niece. On September 8, Edwards said she cried with joy as Brooke embarked on an education where, hopefully, she will never know what it's like to shiver through class in a draughty portable. But the crusade didn't end when Brooke boarded the school bus. As Edwards pointed out, in 48 other First Nations communities across Canada many more children are still waiting for a school, caught in the politics between federal and provincial governments and aboriginal leaders. On September 4, two former Prime Ministers from opposing parties, Paul Martin and Joe Clark, and two former aboriginal leaders, Ovide Mercredi of the Assembly of First Nations and Mary Simon of the Inuit Tapiriit Kanatami, launched "Canadians for a New Partnership." It's touted as a fresh attempt to bring all sides -- aboriginal and non-aboriginal -- together to talk about issues like aboriginal education. The most important part of that conversation will be listening to young people like Edwards. She reminds us that aboriginal education isn't about partisanship, policy or budgets. It's about kids who just want to go to school.